It can be very difficult to get in and out of a vehicle when you have a restricting handicap. AMS Vans Inc. wants to help eliminate that difficulty for you! For this, we are happy to offer transfer seats for handicap vans. Transfer seats are specifically designed to aid wheelchair users who need to transfer from a wheelchair to a vehicle seat. 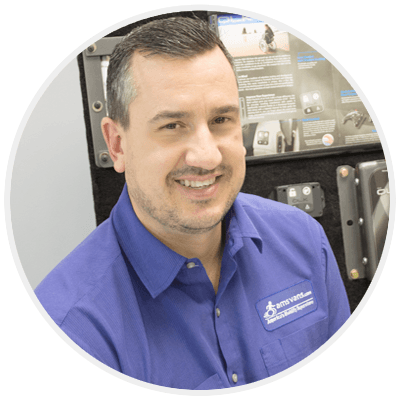 By having a transfer seat installed in your new or used mobility van, you will be eliminating a large majority of unnecessary daily struggle. Manufacturers like B&D and Bruno make power transfer automotive seating easy and accessible. These transfer seats are safe, efficient and comfortable. There is finally a way for wheelchair users to get in and out of any van with ease! 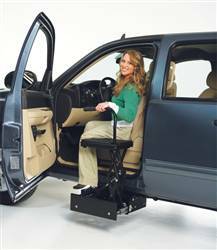 Have a transfer seat installed in your new or used mobility van for wheelchair access from AMS Vans. The Bruno Stow-Away Seat was designed for pickup trucks and larger SUVs for people up to 300 lbs. This TAS device is mounted under the vehicle and allows a person to transfer from their wheelchair into the tallest vehicles. When you come to AMS Vans you're dealing with the people who know wheelchair and handicap accessible vans best. We are able to install our transfer seats without modifying the actual factory OEM seat within the handicap van. AMS Vans can also install transfer seat bases into wheelchair vans during van conversions or alone as an upgrade. For questions on our transfer seats or the installation process, call one of our mobility consultants. We would be happy to answer all your questions and help you get started on improving your quality of life today!